If you want to keep up with current trends, you need to have the best fashion accessories available. Whether you are out with the girls or on your way to a corporate meeting, the right accessories can pull your look together. In my opinion, there is nothing that can give your outfit that “wow” factor than in incredible handbag. If you are wearing that little black dress, your favorite pumps and you are carrying a solid satin clutch, you may just blend in with the other gaggle of women who are wearing the same uniform. You need to add the right bag that will stand out in a crowd and get you noticed. When my kids were younger, I didn’t carry a purse, but instead I carried a diaper bag or an oversize tote to carry all the essentials a mommy needs. As the kids got older, I continued to carry the same large bags that had no style or pizzazz. After a friend jokingly said I looked like I was ready for a play date with my 6 kids, I knew I should reconsider my choice of bags! One of my favorite go to places for a great handbag is Blues by kyky. This company has been on the cutting edge of the Venezuelan fashion industry for years. Started in 1994 by 2 very talented women, a line of gorgeous belts was introduced and they were received with huge attention. In four short years, the pair opened a store in an upscale section of town and soon Blues by kyky was the most sought after store for accessories in Venezuela. Today, the Blues by kyky line contains some of the finest bags and clutches on the market. From the design to the construction, each bag from Blues by kyky is of the utmost in style, quality and looks. By using the best leathers in the world, along with their signature appliques, there is a hand-made handbag for any fashionista. The bag I love is the Mini Patricia Python Mod from Blues by kyky. This stunning snake skin bag, which comes in 3 beautiful patterns, is an amazing addition to any outfit. The size is perfect for all occasions measuring at 11″ wide, 8″ high and 2″ deep. Kyky introduces their Fall 2012 collection including everything from clutches to handbags that blends its unique Venezuelan heritage with New York style.The stylish colors, durability and multi-functional uses of this bag make this one of the best fashion accessories to add to every closet.If you take this bag out for a night with the girls, you are going to get a lot of compliments and a few ladies who must have one just like it. This versatile handbag is perfect for any occasion, will work with slacks and a top, to a smart business suit or your favorite jeans and sweater. The Mini Patricia offers a vibe that only comes from a hot accessory can give. 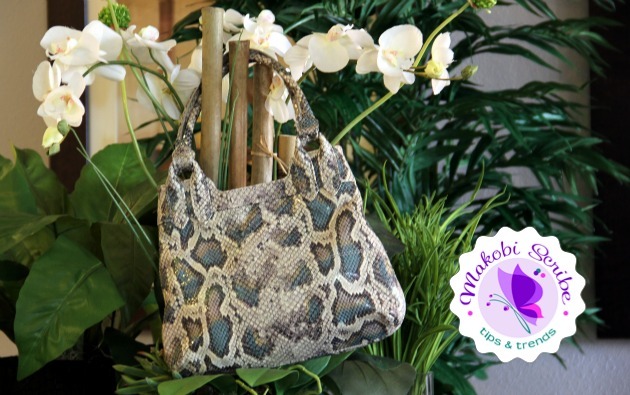 Look for the Mini Patricia Python Mod from Blues by kyky in the upcoming Handbag Heaven event!